This entry was posted in Baking, Baking Chez Moi, Tuesdays with Dorie and tagged bakingchezmoi. Bookmark the permalink. That’s too weird about the rack leaving marks – I have never seen that. In any case your madeleines look lovely! Maybe a brief cooling before removing them from the pan would help. I’ll have to experiment. Love your Madeleins. This happened to me too. Since Dorie asked us to take the Madeleines out of the mold straight from the owen, they were still so warm that the rack left a mark on them. I will make them cool a little in the molds next time. Thanks they were sooo good! Your little cakes are beautiful. They’re so delicate freshly baked, I usually turn them out onto a kitchen towel – acts like a cushion – then transfer them to a rack, ridged-side down. What a great idea to put them on a towel first! I will do that next time and hopefully have prettier “humps”! Your cakes (cookies? – I never know what to call them) came out beautifully. Thanks, I know, they really are tiny cakes aren’t they. 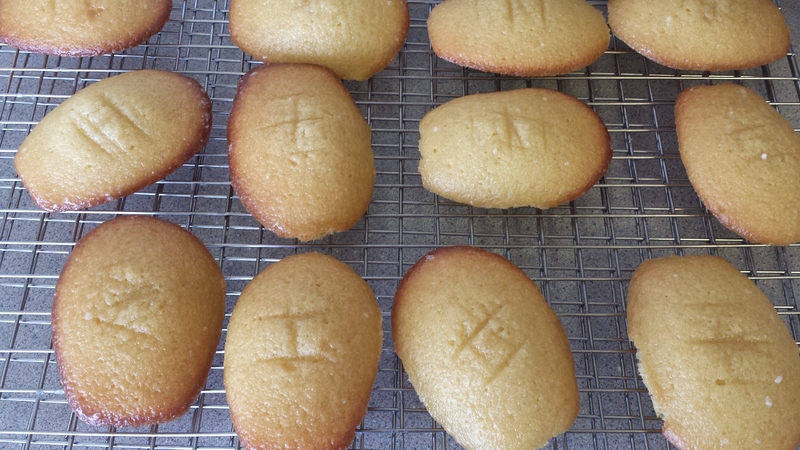 Lovely madeleines! I love Zosia’s suggestion…great idea! I know it’s a great idea! I think I wasn’t the only one is cooling rack marks on my “humps”. Great idea to package them up and give them as a gift. I am sure your friend loved them! Thanks. We are at the stage that we don’t want/need gifts. So a little treat to eat is just the right gift. darned rack marks! I’m sure no one noticed when they were packaged up so cute! I think you are right, they were eaten very quickly! I love that you packaged them up to give to friends as a gift! What a great idea! 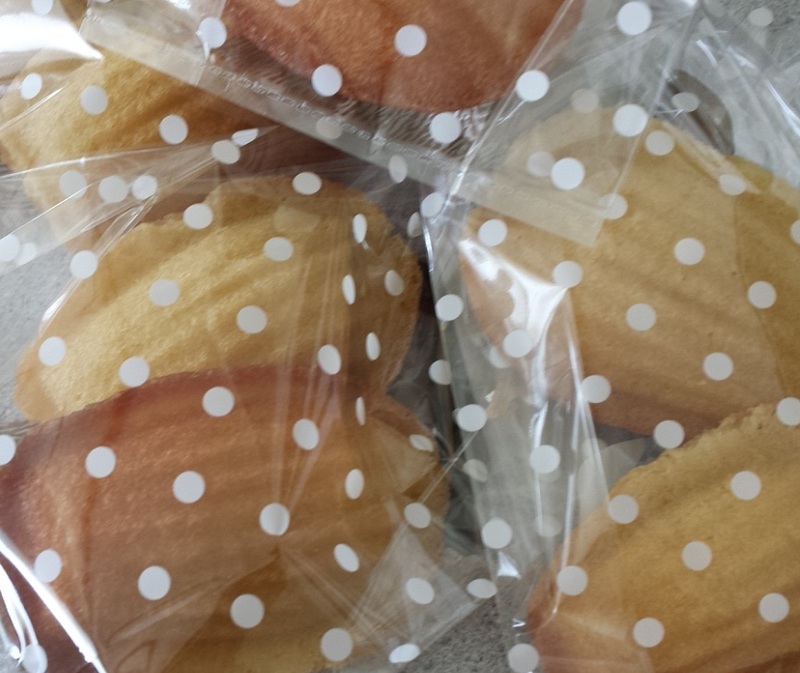 And the dotted cellophane really complements the madeleines — which look great, btw! Well, they look lovely just the same, marks or no marks. I just turn them out of the pan directly on my pastry board. I don’t even mess with a cooling rack. They look so pretty in the polkadotted packaging. These look pretty perfect in the polka dot bags-so cute. I’m sure they were a big hit.